The 12 Powerpoints Secrets Of Life FIGHT. 1. Life Is All About Fight Thinking Otherwise Is Naïve. If You Are Not Ready To Fight You Have Automatically Sign Up For Failure And Defeat. There Is No Time To Get Ready. But There Is All Time To Live Ready. 2. You Have To Beware Of The Enemies Around. Their Only Purpose Is To Kill Your Vision, Empty Your Bank Account; Make You Lose Your Marriage And Family Render Your Life Useless And Finally Make You A Failure. You Have To Be Ready To Defend All That Belongings To You If You Don’t Want To Lose It Says The Law Of Security. 3. Don’t Just Secure Yourself From Enemies Outside, But Be Much More Aware Of Enemies Within. The Enemy Called Procrastination That Is All Out To Stop You From Starting What You Are Called To Start. Think Through For Solution And Lay Hold On What Belongs To You. 4. The Enemy Inside That Will Not Make You To Plan For Good Success I Mean The Enemy Called Average That Will Make You Settle For Usual. Living On Pay Check And Paying Bills Monthly, That Is The Enemy You Need To Fight. 5. Ready To Fight Yourself. DO What You Need To Do And Be Where You Are Suppose To Be. Read The Books And Study Life. The Treasure Belongs To Those Who Start Early. If You Wait So Long You Will Waste For Long. If You Can Win Yourself Nobody Can Win You. If You Can Contest With Yourself Nobody Can Compete With You. The Source Of Good Life Is Self Discipline. Think It, Live It And Believe It. 6. Ready To Fight The Enemy Called Debt. Create A Good Defensive Strategies To Stop Borrowing From Your Territory. It Is One Of The Secrets Of Longevity. Don’t Buy What You Don’t Need To Please People That Don’t Like You In A Place That You Are Not Welcome. Great Life Has It’s Secret In Simplicity. 7. As A Fish Cannot Be Separated From Water, A Seed From Soil, And Bird From The Sky. So A Man Cannot Be Separated From God. You Need To Fight Anything That Want To Stop You From Knowing God, Serving God And Worshiping God. 8. Take The Fight To Your Enemy First. Whatever Makes You Run Today Will Make You Run Another Day. If You Don’t Face It And Fight It, It Will Soon Face You And Chase You And Finally Kill You. 9. Winners Don’t Win Because They Can Fight. They Win Because They Love Winning And They Cannot Do Something Else Than To Win Through Their Fight. 10. 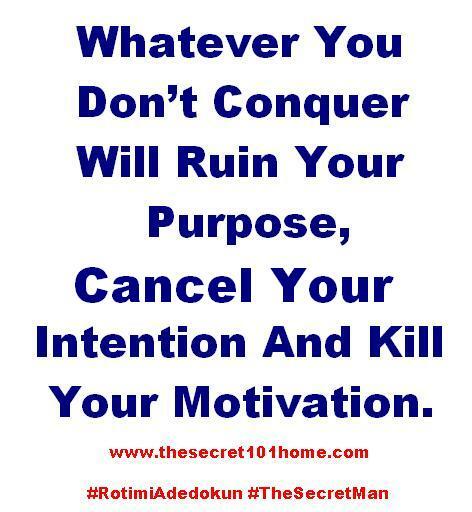 Whatever You Don’t Conquer Will Ruin Your Purpose, Cancel Your Intention And Kill Your Motivation. Nobody Is Remembered For The Problem They Can’t Solve Rather For The Problem They Solved. 11. Remember Only Those That Fight A Good Fight Will Lay Hold On Eternal life. Good Life Is Not Free, There Is Always That Is Attached To The Value It Is Called Fight. 12. I Want You To Please Help Our Fight To Kill Mediocre, Growing Champions And Increase The Number Of World Changers. This Will Be Possibile If You Visit Our Blog Page Everyday And Invite Friends And Family To Do The Same. Also Follow Us On Twitter And Like Our Page On Facebook. This entry was posted in Life and Time Management, Self Development, Spirituality, The Secret, Vitamin Of The Mind and tagged Bishop David Oyedepo On Fight, Everything About Fight, Fight, Fight And WIn Life, Fight For Life, Fight The Good Fight Of Faith, Fight To Live, JIm Rohn On Fight, Pastor E A Adeboye On Fight, Rotimi Adedokun On Fight. Bookmark the permalink.